It’s no secret that small businesses and startups still heavily rely on PHP. Famous for its functionality, extensive market share and user base, and excellent performance, the language still stands strong as the first choice for e-commerce websites, wiki sites, and social media portals. Speaking of PHP development, we’ll eventually get across using frameworks. As it’s not the cheapest and most convenient solution to develop custom solutions, sometimes it’s better to use a fruit of someone else’s experience. Laravel is among the most famous PHP frameworks. And Laravel developers for hire are in the high demand today. A strong demand for PHP Laravel projects has birthed the need for talent which, at its turn, has resulted in good developer salaries. The US is a golden land for programmers – most of the top hires and talent write their codes in the States. Trying to understand what is the cap for a good developer, one has to take a look at American numbers. 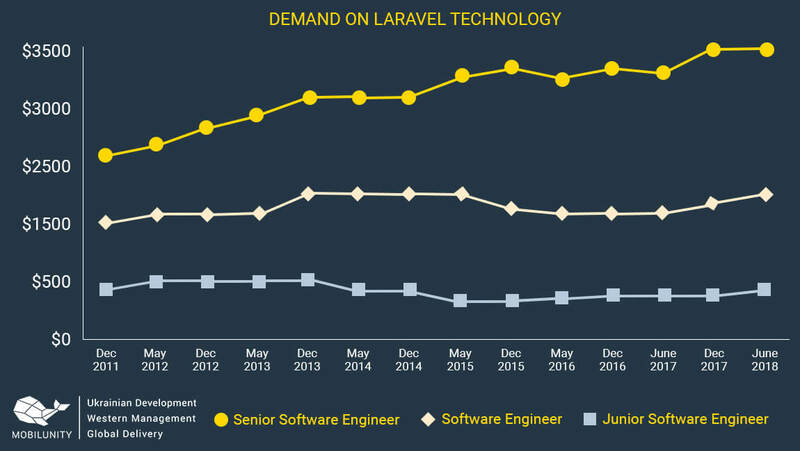 According to ZipRecruiter, the average Laravel programmer salary is $83,000 per year. The developers with the highest rates are located in New York, with Massachusetts and Maryland being respectively second and third states by Laravel developer rates. The European economy is diverse since some countries are economically stronger than others. Calculating one estimate number doesn’t give a clear landscape of the market for Laravel developer – here are the stats for key European countries collected by Pearson Frank. According to a report created by DOU, PHP is the fourth popular programming language in Ukraine. 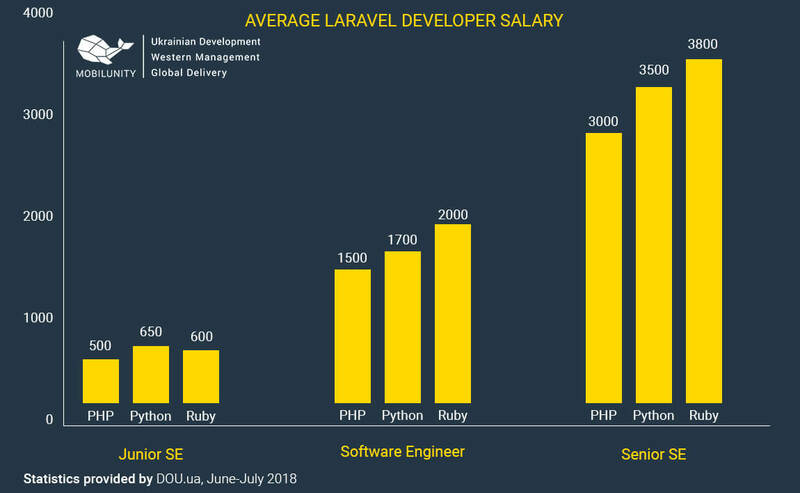 However, due to high competition, the salary of PHP developers isn’t as high as that of Python and Ruby SEs. For the last 7 years, the salary of a junior PHP developer had known no major growth nor downfall, being steadily at $500. A similar dynamics can be traced speaking of middle PHP developers. Seniors, however, started evaluation their work higher than they used to – with an average Laravel jobs salary being around $3,000 per month. Unfortunately, there isn’t a report in Ukraine that would give a broader landscape of a Laravel framework job salary. That’s why we conducted such a research based on the data aggregated by Indeed.com and PayScale. How to Get the Top of the Cake? Location. 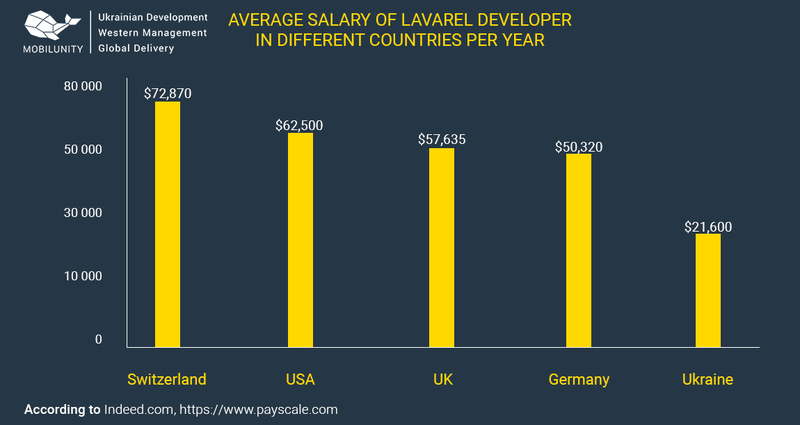 Working in New York, Berlin, or London, Laravel developers stand a better chance of a higher salary than their colleagues with the same level of expertise who live in little cities or rural areas. Level of framework comprehension and overall PHP-skills. Though Laravel developer mainly uses the framework itself for development, it doesn’t hurt to be a confident PHP-coder since sometimes you might have to create a custom solution. Experience as a system admin. Having a dual system admin/developer workflow might not be quite comfortable as it obliterates the predictable schedule developers are supposed to follow. However, the opposite is also true: all the best software engineers are also top-tier system admins. So, if you’re looking for a top salary be sure to improve both sets of skills. Soft skills. It’s common to picture SEs as introverted techies who rarely speak up and quietly do their thing. However, even if it’s actually the case for many teams, employees still look for professionals who have no issues with communication and are comfortable in expressing their ideas suggestions. PHP is on the rise today as the language that’s been written specifically for the web. It’s highly used by startups and small businesses as a relatively cheap and high-performing solution. Some of them tend to develop a custom solution – yet, a lot of companies name Laravel best framework for PHP by many definitions. The average salary of an American Laravel developer is over $80,000 per year. NY takes the lead in developer rates. In Europe, the cap is a few times lower, with an average salary of a junior Laravel developer around $30,000. In Ukraine, there’s a strong competition between PHP hires which affects the salary on the market. Thus, Ukrainian workforce is one of the most affordable worldwide. For Laravel developers, it’s impossible to define a single factor that influences the Laravel developer hourly rate. One thing is evident, however – the level of PHP skills and framework understanding is still the most important to employees. Contact us now to save your budget with Ukrainian Laravel developer salary!